Growing up, there always seemed to be a never-ending list of rules, or things I should and should not do. Also, when my parents divorced, and my Mother remarried, I learned that different places (households) had their own set of rules. As a child, well this just all became confusing at times. As children of a loving Father, we are reminded of another set of rules, which eventually became engraved in stone. In Exodus 19, we learn how these commandments came to be. If you were Moses, would you have been so patient to await God’s coming, to deliver a set of rules for His chosen people? As children, were we ever so patient to listen to our parents when they told us what we should and should not do? I am guessing some of us would not have been this patient, but if so, we would not have been so quick to follow God’s instructions to the letter. Yet, this is exactly what Moses did, and in doing so, received a list of rules which still stands as a guide, not only for Christians worldwide, but as a strong set of standards most humans follow on a daily basis. So what are those Ten Commandments gifted by God, to Moses, on Mt. Sinai? Exodus 20:1-17 offers them in detail. “Then God spoke all these words: I am the LORD your God, who brought you out of the land of Egypt, out of the house of slavery; you shall have no other gods before me. You shall not make for yourself an idol, whether in the form of anything that is in heaven above, or that is on the earth beneath, or that is in the water under the earth. You shall not bow down to them or worship them; for I the LORD your God am a jealous God, punishing children for the iniquity of parents, to the third and the fourth generation of those who reject me, but showing steadfast love to the thousandth generation of those who love me and keep my commandments. You shall not make wrongful use of the name of the LORD your God, for the LORD will not acquit anyone who misuses his name. Remember the Sabbath day, and keep it holy. Six days you shall labor and do all your work. But the seventh day is a Sabbath to the LORD your God; you shall not do any work–you, your son or your daughter, your male or female slave, your livestock, or the alien resident in your towns. For in six days the LORD made heaven and earth, the sea, and all that is in them, but rested the seventh day; therefore the LORD blessed the Sabbath day and consecrated it. Honor your father and your mother, so that your days may be long in the land that the LORD your God is giving you. You shall not murder. You shall not commit adultery. You shall not steal. You shall not bear false witness against your neighbor. You shall not covet your neighbor’s house; you shall not covet your neighbor’s wife, or male or female slave, or ox, or donkey, or anything that belongs to your neighbor. The First Commandment is about Loyalty. The Creator of the universe declares He is our God and our deliverer and asks us to demonstrate our love for Him by having no other God’s. The First Commandment is the first of a series of four that define our relationship with our Heavenly Father. Establishing, developing and maintaining that personal relationship with the true and living God is the most important commitment we can ever make. That is the primary focus of the first of the Ten Commandments, “You shall have no other gods before Me”. We should love, honor and respect Him so much that He alone is the supreme authority and model in our lives. He alone is God. We should allow nothing to prevent us from serving and obeying Him. The Second Commandments is about Worship.. The one and only true God loves us so much that He is jealous of our love and does not want to share our love by us bowing down to meaningless idols. The Second Commandment goes to the heart of our relationship with our Creator. It deals with several crucial questions. How do we perceive God? How do we explain Him to ourselves and to others? Above all, what is the proper way to worship the only true God? The Second Commandment is a constant reminder that only we, of all created things, are made in the image of God. Only we can be transformed into the spiritual image of Christ, who of course came in the flesh as the perfect spiritual image of our heavenly Father. The Third Commandment is about Reverence. God asks us to respect His Holy name and not to use it in vain. The Third Commandment focuses on showing respect. It addresses the way we communicate our feelings about God to others and to Him. It encompasses our attitudes, speech and behavior. Respect is the cornerstone of good relationships. The quality of our relationship with God depends on the love and regard we have for Him. It also depends on the way we express respect for Him in the presence of others. We are expected always to honor who and what He is. Conversely, the use of God’s name in a flippant, degrading or in any way disrespectful manner, dishonors the relationship we are supposed to have with Him. This can vary from careless disregard to hostility and antagonism. It covers misusing God’s name in any way. The Fourth Commandment is about Sanctification and Relationship. God starts off the fourth Commandment with the word “Remember”. This is because He knew we would forget it. God asks that we keep it set apart for Holy purposes so we can draw nearer to Him. The Fourth Commandment to remember the Sabbath concludes the section of the Ten Commandments that specifically helps define a proper relationship with God, how we are to love, worship and relate to Him. It explains why and when we need to take special time to draw closer to our Creator. It is also a special sign between us and God forever, that it is Him that sanctifies us, Him alone we belong to and worship. The Sabbath, the seventh day of the week was set apart by God as a time of rest and spiritual rejuvenation. The Fifth Commandment is about Respect for Parental authority. God instructs us to show love for our parents by honoring them. The Fifth Commandment introduces us to a series of Commandments that define proper relationships with other people. The fifth through to the 10th serve as the standards of conduct in areas of human behavior that generate the most far reaching consequences on individuals, families, groups and society. Families are the building blocks of societies that build strong nations. When families are fractured and flawed, the sad results are tragic and reflected in newspaper headlines every day. Any individual or group, including whole nations that understand the importance of strong families reap the rewards of an improved relationship and blessings from God. The Fifth Commandment shows us from whom and how the fundamentals of respect and honor are most effectively learned. The Sixth Commandment is about Respect for Human life. God asks us to demonstrate love and not hate towards others by not murdering. We must learn to control our tempers. Taking another person’s life is not our right to decide. That judgment is reserved for God alone. That is the thrust of this Commandment. God does not allow us to choose to willfully or deliberately take another person’s life. The Sixth Commandment reminds us that God is the giver of life and He alone has the authority to take it or to grant permission to take it. God wants us to go far beyond avoiding murder. He requires that we not maliciously harm another human being in word or deed. God desires that we treat even those who choose to hate us respectfully and do all within our power to live in peace and harmony with them. He wants us to be builders, not destroyers of good relationships. To accomplish this we must respect this wonderful gift of this precious possession, human life. The Seventh Commandment is about Purity in Relationships. God asks us to express and demonstrate our love for our partner by not committing adultery. Adultery is the violation of the marriage covenant by willful participation in sexual activity with someone other than one’s spouse. Since God’s law sanctions sexual relationships only within a legitimate marriage, the command not to commit adultery covers in principle, all varieties of sexual immorality. No sexual relationship of any sort should occur outside of marriage. That is the crux of this Commandment. Most of us need the support and companionship of a loving spouse. We need someone special who can share our ups and downs, triumphs and failures. No one can fill this role like a mate who shares with us a deep love and commitment. The Eighth Commandment is about Honesty. God instructs us to show our love and respect for others by not stealing what belongs to them. The Eighth Commandment safeguards everyone’s right to legitimately acquire and own property. God wants that right honored and protected. His approach to material wealth is balanced. He wants us to prosper and enjoy physical blessings. He also expects us to show wisdom in how we use what He provides us and He does not want possessions to be our primary pursuit in life. When we see material blessings as a means to achieve more important objectives, God enjoys seeing us prosper. To Him it is important that generosity, rather than greed, motivate the choices we make. The Ninth Commandment is about Truthfulness. God says if we love others we should not deceive or lie to them. How important is truth? The Bible says that Jesus is “the way and the Truth” John 14:6. To fully appreciate the Ninth Commandment with its prohibition of lying, we must realize how important truth is to God. Jesus Christ said of God the Father, “Your word is truth” John 17:17. As the source of truth, God requires that His servants always speak truthfully.. God expects truth to permeate every facet of our lives. Everything in the life of a Christian is anchored to truth. God wants us as His children, to commit ourselves to truth and reflect it in everything we do. The Tenth Commandment is about Contentment..
God instructs us not to covet because He knows it can entrap us into even greater sin. To “covet” means to crave or desire, especially in excessive or improper ways. The Tenth Commandment does not tell us that all of our desires are immoral. It tells us that some desires are wrong. Coveting is an immoral longing for something that is not rightfully ours. That is usually because the object of our desire already belongs to someone else. But coveting can also include our wanting far more than we would legitimately deserve or that would be our rightful share. The focus of the Tenth Commandment is that we are not to illicitly desire anything that already belongs to others. The opposite of coveting is a positive desire to help others preserve and protect their blessings from God. We should rejoice when other people are blessed. Our desire should be to contribute to the well being of others, to make our presence in their lives a blessing to them. The last of the Ten Commandments is aimed directly at the heart and mind of every human being. In prohibiting coveting, it defines not so much what we must do but how we should think. It asks us to look deep within ourselves to see what we are on the inside. As with each of the previous nine Commandments, it is directed toward our relationships. It specifically deals with the thoughts that threaten those relationships and can potentially hurt ourselves and our neighbors. Now we know what we should, or should not do. 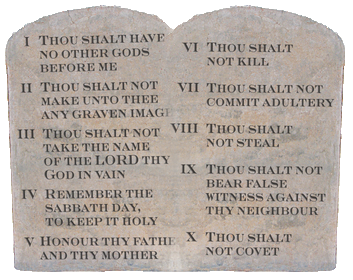 But though these rules seems simple, and easy to follow, this does not mean every one can adhere to these commandments, all the time. After all, we are only human. And as a young child will inevitably mess up, so shall we, the children of a forgiving Father. So what do we do? Hide our face in shame, or pretend we didn’t do anything wrong, or worse, try to hide the evidence. Oh I did that when I was little, but somehow my parents always found out what I did. Their response? Normally it began with this statement: Why didn’t you tell us what you did, instead of lying about it at first? I figure most parents are like this, only seeking the truth from a misbehaving child. Then they can reason with him or her, offer solutions (or mild reprimands), and then show the child how much they love him/her. Is this not how our heavenly Father responds, when we have slipped up and broke a rule? He knows we are only human, and though He offers us a set of guidelines to live by, also knows we may goof up. But by His grace we are saved, and by His love we are forgiven.